The 2799-22CX M18™ 2-Tool Combo Kit includes the 1/2” Compact Brushless Hammer Drill Driver (2702-20) and the 1/4” Hex Brushless Impact Driver (2750-20). The M18™ Cordless System's patented technologies and electronics, innovative motor design, and superior ergonomics provide the most efficient blend of power, weight and performance in the industry. The M18™ ½” Compact Brushless Hammer Drill/Driver is the Most Compact 18v drill on the market and delivers Over 50% Longer Run-Time than drills with brushed motors. The M18™ 1/4” Hex Brushless Impact Driver is the Most Compact Impact Driver in its class and delivers Over 50% Longer Run-Time than Impact Drivers with brushed motors. 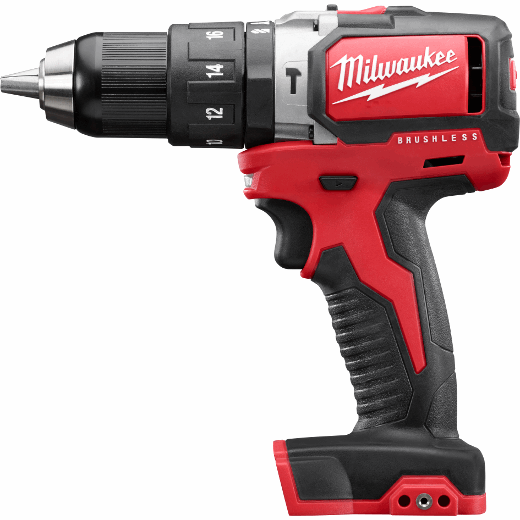 Both tools feature Milwaukee® built brushless motors, REDLINK™ Electronics, and REDLITHIUM™ batteries that provide more efficient power delivery, for fewer trips to the charger. This kit includes (1) REDLITHIUM™ XC4.0 battery for maximum performance and 2X longer run-time. It also includes (1) REDLITHIUM™ 2.0 battery, which is compact and light weight, ideal for fastening applications. The M18™ ½” Compact Brushless Hammer Drill/Driver is the Most Compact 18v hammer drill on the market and delivers Over 50% More Run-Time than drills with brushed motors. The Milwaukee® built brushless motor, REDLINK™ Electronics, and REDLITHIUM™ batteries provide more efficient power delivery, for fewer trips to the charger. At only 7-3/8” long and 3.9 lbs. (with battery), this drill provides excellent control & balance in a compact size, perfect for work overhead or in tight spaces. This compact hammer drill delivers 500 in-lbs. of torque and 0-450/0-1,800 RPM, for a wide range of drilling and fastening applications. An all-metal gear case and 1/2" metal chuck provide maximum durability. Milwaukee® Brushless Motor: Optimized for efficiency, this motor delivers over 50% more run-time and 2X longer life than brushed motors. Also delivers 500 in-lbs. of torque and 0-450/0-1,800 RPM for a wide range of drilling & fastening applications. The M18™ 1/4” Hex Brushless Impact Driver is the Most Compact Impact Driver in its class and delivers Over 50% More Run-Time than Impact Drivers with brushed motors. The Milwaukee® built brushless motor, REDLINK™ Electronics, and REDLITHIUM™ batteries provide more efficient power delivery, for fewer trips to the charger.At only 5-3/8” long and 3.1 lbs. (with battery), this impact driver provides excellent control & balance in a compact size, perfect for work overhead or in tight spaces. The M18™ ¼” Hex Brushless Impact Driver delivers up to 1500 in-lbs. of torque and 0-2,800 RPM for a wide range of fastening applications. Milwaukee® Brushless Motor: Optimized for efficiency, this motor delivers over 50% more run-time and 2X longer life than brushed motors. Also delivers 1,500 in-lbs. of torque and 0-2,800 RPM for a wide range of fastening applications. Delivers more runtime, power and speed than standard lithium-ion batteries. The M18™ REDLITHIUM™ XC Extended Capacity Battery is designed with superior pack construction, electronics, and performance to optimize work per charge and work over pack life. It offers 3.0 amp-hours of runtime. 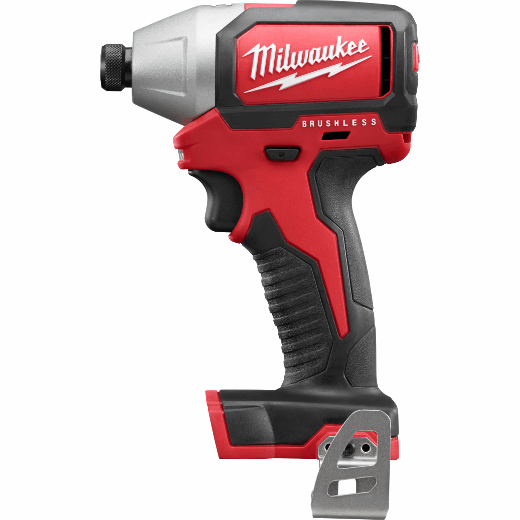 With built-in Milwaukee durability, this battery runs cooler and performs in climates below 0°F/-18°C.Managed by Milwaukee’s exclusive REDLINK™ Intelligence, the battery features overload protection to prevent you from damaging your cordless power tools in heavy-duty situations, while the discharge protection prevents cell damage. The temperature management system and individual cell monitoring help maximize battery life. Use this extended-capacity battery to power your Milwaukee M18 cordless power tools.